The Voters Have Spoken. Now It’s Time To Vote. Again. I suspect it was someone having a bad day, and maybe that provided good venting. So, fine. Other than that, things went smoothly, I thought. Anyway, here are the top 4 finalists, you can vote once a day, so tell your friends and get to campaigning! The world would be a better place if more people said that while getting dressed in the morning. I’ve wondered if people hit the wrong button. It happens, I suppose. Just ask the electorate in Florida in 2000. Now I feel guilty. To make up for it, I am booing my own comment. To balance the unbalanced nature of this counterbalance, I will thumbs DOWN your comments. Hey, this is fun! Ha ha! Booooo! Boooo! Right?! Right?! I really thought, “Aw MAN” when I saw that. And then it made me wonder if I’d lost my sense of humor, because who would do that SERIOUSLY? I’m actually surprised WP doesn’t have the option where people can simply “like” comments. Seems like a logical extension. That’s too much like Facebook, the big brother WordPress admires/hates because Mom & Dad likes them better. I missed all of this. How did that happen? 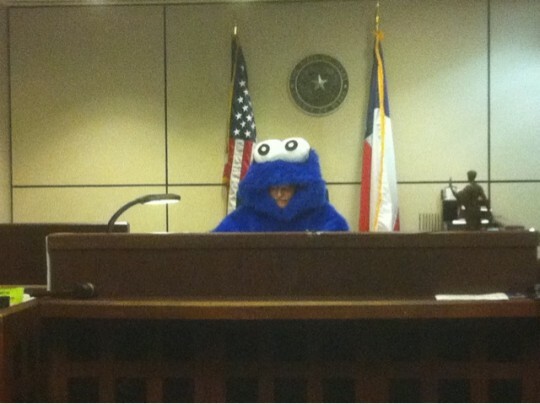 I would think I would have remembered seeing a picture of a guy in a cookie monster suit. And the booing. That, alone, could be an entire post’s worth of debate, I think: “What is the Law & Order sound?” Personally, I think it’s clearly a “CHUNG CHUNG,” but I know plenty of people who are positive it’s something else entirely. It took all my will not to change his entry. I do tend to say: DUN DUN, now that you mention it. But I just liked the concept of DOINK DOINK. IYKWIM. I’ve seen the thumbs up and down ‘offerings’ but don’t think that I’ve ever used them. I guess people like to give their opinions. Christ knows I like to give mine & I don’t know what I’m talking about. You know what they say about opinions. Wait — didn”t you tell us to use our thumbs? I mean instead of our heads? People thumbs-down comments? They do that? Oh god, please no. Nooooo. And just like that, I’m transported back to 8th grade. I think I’m having heart palpitations. My palms are sweaty. And I’m growing a pimple on my forehead. I was about to say I love the *Doink*, but it sounded all kinds of wrong. Insert unstated-but-understood “Doink” comment that’s even funnier than Tori’s.